Lie: It will only take 5-minutes. I need to tell you a secret. I lie to myself all the time. Every day. Several times a day. What’s worse is that more often than not, I believe my lies. I intentionally disregard real life and my own humanity with impossible optimism for what will be accomplished. I’ll make a list for the day or week that includes many “5-minute” tasks that could never ever actually take only 5 minutes. Then, as if by surprise, I’ll spend the entire week feeling behind and frustrated with my inability to check off all the boxes. This is no way to work. In fact, it’s no way to live. I’m far more productive when I look at my schedule realistically and build in time for rest, time for transition and am realistic about how long something will take. For instance, vacuuming the living room may only take 5-minutes. But my vacuum is stored downstairs, which means it will take another 5-minutes to get the vacuum, and put it away. On top of that, there is always clutter in our well-trafficked living room so add another 5 minutes for tidying up. My 5-minute chore time commitment just quadrupled in length. The funny thing is, 20-minutes is still doable and actually not difficult when I plan for it. So why don’t I plan for it? Read: You aren’t Doing it Wrong. Dinner is another offender. I’ll often plan to cook something in the oven for the amount of time it takes to cook, completely forgetting the 10-15 minutes it takes to let the oven preheat. This, in turn pushes dinner and ultimately the kids’ bedtimes back and if you are a parent, you know the difference a few minutes can make at bedtime. If you miss the window, let’s just say it’s not pretty. This issue not limited to household chores, though. I work from home so I am dealing with this on every level, every day. I tell myself the 5-minute lie when it comes to just about any task, and I spend my days feeling rushed and frustrated. You’re probably in the habit of making to-do lists each week. If you are like me and fall victim to the 5-minute lie, this week, I want to challenge you to try something new. And so on. It doesn’t take me 35 minutes to drive to Calvin’s school and back. It’s more like 15-20, but by the time I lock up the house, visit in his classroom for a few minutes and get everyone back inside, that 20 minutes is long gone. So why do I keep lying? It has to stop. Once you have made your list using appropriate times that each task will really take, you can reorder your list to fit back together in the most efficient way. Something you might typically do in the afternoon may actually fit better with your schedule in the morning. My hope for re-organizing my to-do list this way isn’t that I would get more done. There are only so many hours in the day. However, I do think this will eliminate much of the unneeded stress I add to my life by poor planning and a lack of time management. What do you think? 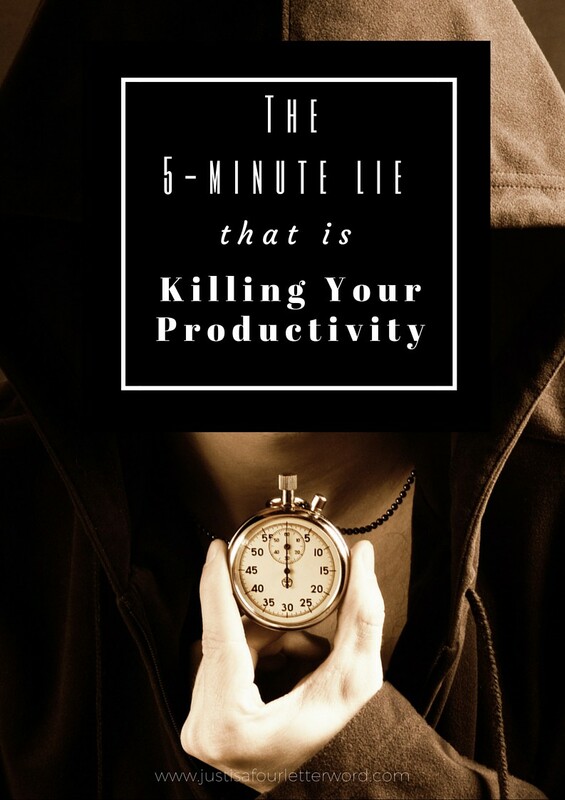 Are you a victim of the 5-minute lie? How do you fight this habit? I 100% do this to myself. I think it’s because I want it all to go smoothly, but the reality is it never does. I’m always amazed by how much time simple tasks can take! It’s so true! Adding some buffer time to that stuff makes such a huge difference. I do this to myself all the time. I’m so guilty of this, but I just started working on it this week! Good luck! I’d love to check in after a while and see how it’s going. Working on this as we speak and I tackle like 1000000 things today! YYYYAAAAASSSSSSS. . .WHY do we do this to ourselves?? I was recently ranting to my family about WHY do I underestimate how long it will take to do something – I KNOW BETTER! Great post! Thank you! I don’t know that I will ever learn. If you could see my to-do list for today….